The Hummingbird update was released in early December and is supposed to be the biggest and most fundamental change since they introduced the caffeine indexing system in 2010. Where other updates have been a patch on top of existing software, this update is more of fundamental code change. The effects of this update are not yet clear, as only a few websites have dropped dramatically. Here are a few clues as to if you are being influenced or hit by the Hummingbird update. Have your websites dropped rank since December 2013? Have your websites been rising in rank since December 2013? You may have been hit in another way and it may be that your ranking is rising. Not everybody is negatively affected by Google updates. The people who fall in rank have to be replaced by somebody else. Are your rankings improving? If so it may be a good idea to keep doing the SEO stuff that you normally do. In other words, you should keep up the good work and be thankful that the current Google update approves of your SEO methods. Have you noticed that your backlinking efforts have been fruitless recently? One note about the Google Hummingbird update is its affect on backlinks. We all know that backlinks have been the most powerful SEO factor in a while, and previous updates have all affected them in some way. One assumes that the most current update is going to affect them again, and most obvious way is by making some forms (or all forms) of backlink less effective when considering your SEO. Is your search engine rank roughly the same but less traffic appears? This is something that a clever or observant person may spot, and it has a twist of counter-intuitiveness to it. Are your search engine rankings roughly the same but your traffic numbers are shrinking? If this is the case then the Hummingbird has hit you and it has done it by making the search queries you used to benefit from less popular. This means you still rank at the same place but less people are typing in the search queries needed to see you. Have you noticed that some pages are now ranking above others? This is where your own website has a shift and some pages start to become more popular than they used to be. This is probably due to the Hummingbird update and you may learn from the ones that are ranking up to see if you can apply those principles to the rest of your website. Are your longer content-filled pages ranking higher? Google did say that the longer detail/content filled articles were going to be the ones that ranked the highest. Have a look at your content to see if your longer content-filled pages are ranking higher. You are being affected by the Google Hummingbird if they are. Are your more flimsy pages less search engine friendly? This is the opposite of the point above. This is another sign that your website has been hit by the Hummingbird update. The more flimsy pages are bound to go down the search engine results pages. But, many pages have little content in them if they have another use. If your web page does have another use such as a tool or useable page element then it should not really go down in the search engine results unless the page SEO is really bad. It may be that the PageRank function is being retired or slowed down to a stop. Your PageRank may have fallen at the end of the year 2013, but you need not worry too much about it as it may not be a terribly bad thing. Create a web page that has a lot of keywords and a web page that is heavy on content but does not really have a stand-out keyword percentage. See if one ranks above the other and you may see how the Google Hummingbird update is affecting you. Kate Funk is a writer and blogger of essay writingservice . She is the author of numerous essays on SEO, internet marketing. 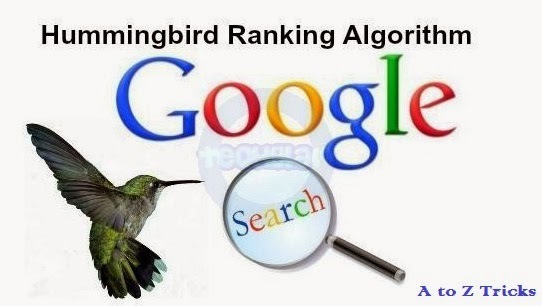 Just Increase the number of posts and number of backlinks.the hummingbird algorithm will be recovered if affected. Just promote your site to several groups it will recovered soon. Thank you Amarnath. I was struggling to get solution for this issue. All suggested the same way to improve site.